Pangolin Diamonds Corp. (TSX.V: PAN) said last week it had extracted high-pressure garnets that point to a possible diamond-bearing kimberlite pipe at one of its exploration projects in southwestern Botswana, reports MiningWeekly.com. 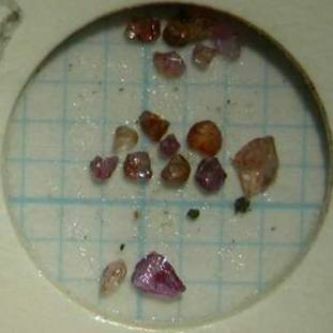 Veteran geologist and Pangolin chairman Dr. Leon Daniels said in a written statement he had never seen such a high concentration of garnets in a drill core sample area of this size in Botswana before. Further drilling is taking place and more results are to come. The company believes this find is similar to the one recovered from the DK2 kimberlite pipe in the Orapa field found at De Beers-operated Letlhakane mine, one of the two largest in the world, in the country's central district. Pangolin owns 11 prospecting licences in Botswana, including the Tsabong North, Jwaneng South, Malatswae and Mmadinare projects. The country supplies 21% of global rough diamond production, which makes it the largest diamond-producing nation in the world by value. Image courtesy Pangolin Diamonds Corp.